Pluots are complex hybrid fruits that are part plum and part apricot in heritage. Pluots have a majority of plum parentage and therefore, have smooth skin like plums. These fruits were originally invented in the late 20th century by Floyd Zaiger and are now grown in parts of Washington and California. Some varieties of pluots are sometimes called interspecific plums, or dinosaur eggs. 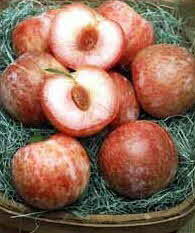 Pluots and Apriums (another plum and apricot hybrid) are known for their sweetness and flavor; the sugar content of these fruits is much higher than that of a plum or apricot alone.